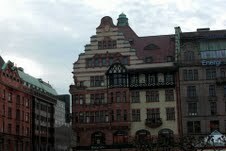 Arrived in Copenhagen then took a train to Malmö – a very short and easy journey. It is so easy due to the Øresund Bridge and the Drogden Tunnel – two magnificant pieces of engineering. Once in Malmö I thought I could walk to my hotel but no, it rained too much and in no time I was soaked. I therefore took a taxi. I then realised that the taxis in this area can be extremely expensive. The very short ride, approximately 8 minutes on foot, costs me about £12 – I was stunned and promised myself I will never take a taxi again or at least opt for a reputable firm. On Tuesday morning I set up the O’Reilly table and hoped (wrongly) I would be able to visit Malmö during the afternoon. No such luck – the credit card machine (among other things) was playing up. I had to have it fixed before the conference. By the end of the day everything was fixed and I could relax. Unfortunately sightseeing was out as it was very dark and still pouring with rain. So decided to look at a little television – not a good idea. Why do we always see imported American series in other countries? Is it because the language is not complicated and it is a good way to learn English? Wednesday, I got to the venue before 8.00 and there was already a lot of people there. 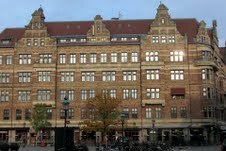 The venue is Slagthuset which allegedly means “slaughter house”. Please feel free to correct me if this is not the case. The day started with the keynote “Software Won – So What Now?” by David Rowan. Then the conference divided into 7 tracks – I should think a very difficult choice for the delegates. The last keynote was by Jim McCarthy – “Culture Hacking and the Coming Era of Magnificence”. Evening activities followed with the Øredev jazz concert, in keeping with the Øredev tradition, and then the Øredev quiz put together by the speakers. Thursday had an early start again with a keynote by Reginald Braithwaite – “The Rebellion Imperative”. After the talks we had another hour of jazz followed with Alexander Bard’s talk “The rebels come out online”, concerning the influence the internet has over us. I was wondering whether anyone had any thoughts regarding whether the internet really has any control over us? Please feel free to elaborate in the comments section. Friday started with Jonas Birgersson’s keynote “Tailwind/Headwind in the Pursuit of the Fibre to All”. The day finished early with Hojun Song “From Collective Intelligence to Collaborative Creation”. During that time we had to remove all stands, books etc. to leave the place free for a dinner of over 300 people. I don’t think I have ever seen a place change character in such little time. All at once you can see the flooring (carpet tiles) being removed and replaced immediately by tables already fully dressed for dinner – white table cloth, glasses, cutlery, vase of flowers and of course candles. 50 videos are already published on the Øredev’s website and more will be online tomorrow! They can be found here. Impressed by the content? Why not pencil in Øredev 2013 which will be held on November 4-8 next year (same place)? 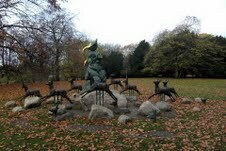 Take the opportunity to look at Malmö, it is worth visiting.